What's the best way to do FA or PCA in the Tidyverse? Right now, I switch to base R using princomp() or the pysch package for my series reduction work. Are there any solutions that fit into the tidyverse workflow? You can do it similar to other types of modelling methods using list-columns and purrr, broom, and dplyr functions. You can extend this as far as you would like, with multiple models by grouping prior to nesting. You can also extend the graph easily just like you would for any other ggplot. To see some of the options for the autoplot pca specific graph, you can look at ?ggfortify::autoplot.prcomp. 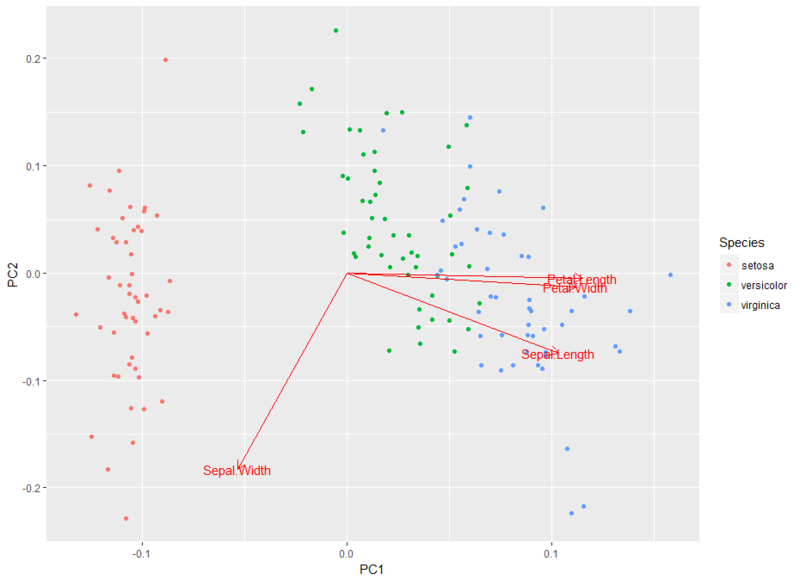 It is worth noting that the autoplot.prcomp method only takes the UK spelling of colour =. I am not that familiar with factor analysis but I would imagine you could use this same workflow with it. The big dependency is whether broom has a tidy/augment/glance method for that model type. But even if it doesn't, you can still access the model once it is in a list column, it just may look a little more hacky. This is incredibly helpful. Thanks so much. Out of curiosity, why not stick with base-R or the psych package? This setup seems better than the tidyverse because base-R and psych aren't going to mess with their stable foundation any time soon. Sticking with this route, you know the same code will work in 1 year, 2 years, or 10 years from now. Disclaimer - the tidyverse is awesome. I update my code to use as much of the tidyverse packages as possible once I learn new tidy package functions. Yet I still use base-R and psych for PCA and EFA because both are super simple and give all the info I want/need. I would say that one of the major benefits of using this workflow is the ability to extend it to run multiple models or sub models all at once. It also provides the models in a format that is easy to work with (especially if there are broom methods for the model type). In addition, the method I provided did not abandon the base-R function that is used to perform the PCA, rather it just implemented it in the framework of the tidyverse. This allows for easy manipulation of model results and it stores all of the results in a convenient place, i.e., in a single data frame, rather than in several different variables that you then have to keep track of. @timpe, if your question has been answered, would you mind marking the solution? That way, someone in the future can come along and easily see what worked for you. How would I go about getting the loadings for a specific number of components, using this method? My "un-tidyverse" method has historically been to use psych::principal(). @phil Sorry for the super late response. I meant to respond to this when you asked but ultimately forgot. I am not familiar with the psych::principal function and it does not look like there are broom methods for this model type. However, you can still compute the model and operate on it in the same manner shown above. #> Test of the hypothesis that 1 component is sufficient. Created on 2018-06-20 by the reprex package (v0.2.0). As a note, the graphics aren't as compatible when you use base graphics (as it seems the psych package uses) since the graphs are just simply plotted when run in a mutate call rather than saved as an object like ggplot objects. But this method would still help you keep your model objects tidy with the data. Hey @tbradley, just came across the answer. For some reason, the solution won't work unless I do it within a reprex. Error in mutate_impl(.data, dots) : Evaluation error: 'data' is missing. Which portion of the code is failing? If it is working in the reprex, my first guess would be some issue with your local session, but without knowing which piece of code that is failing, I can't give you too many specific pointers. It seems to be this part. Weird! If it's working in the reprex and not in your global environment, there's a possibility of a name collision, or something else in your environment interfering. Alright, I just re-tried and everything seems to work perfectly. So yeah I guess there was some conflict somewhere. So... nevermind! Thanks for the help.